Drive knob - The drive setting will boost the input signal, causing a heavier distortion. Bias knob - The bias will add a DC offset to the signal before distorting. Adding some bias can prevent the distorted audio from sounding hollow and uninteresting. Spread knob - The spread will add different amount of bias to the left and right channels. This can give some nice and subtle stereo widening. Type - The flavor of distortion. 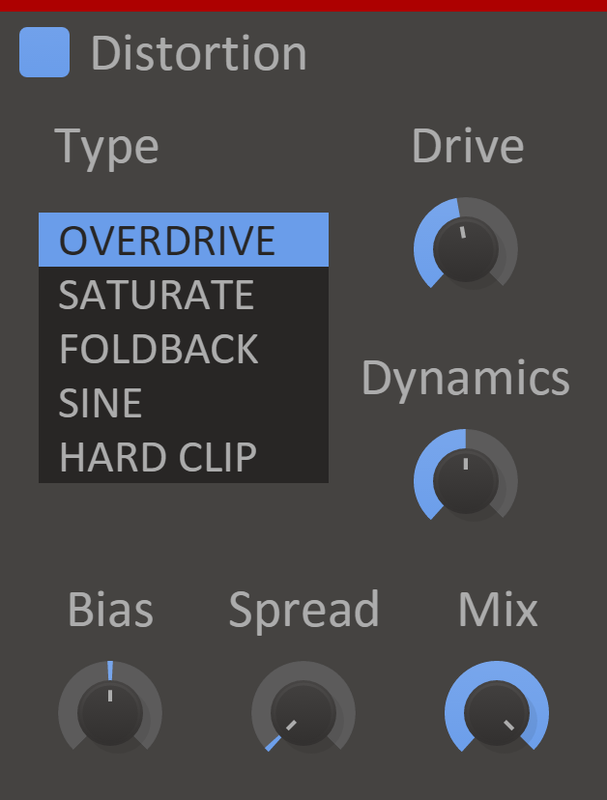 Select between overdrive, saturate, foldback, sine and hard clip. Dynamics - A common problem with distortion is that it can remove the dynamic content of the input signal, forcing the output to maximum volume. Turn up this knob to preserve the dynamics of the input. Mix knob - The dry/wet mix of this effect. A lower value will let some of the unmodified signal through. Settings panel - Whenever you have your mouse cursor over a snapin theree is a small arrow at the top right corner (not visible in screenshot). It opens a settings panel where you handle presets. Enabled checkbox - The small checkbox to the left of the plugin name is a checkbox that bypasses the effect when disabled. Resize handle - The bottom right corner of all Kilohearts plugins is a resize handle for scaling the UI to any size. This allows you to get a good view of the controls whatever the screen resolution, and also comes in handy if you need big controls, e.g. when using Distortion as a real-time effect on a touchscreen monitor during a live set. (This is not available when the snapin is used inside a snapin host.). Distortion shines on it's own, but it was primarily created to power up the different "Snapin Hosts" Kilohearts offer. These are bigger effects units that utilize all the available snapins and give you a really fun and creative workflow for combining them in any way you can think of. So have a look at Snap Heap and Multipass right now. Distortion is also available as a Rack Extension for Reason over at the Propellerhead shop.